Blindness‘ original Portuguese title is Ensaio sobre a Cegueira (literal translation: Essay on Blindness). Written by Nobel Prize-winning Portuguese author José Saramago, it’s one of his most famous novels. It was later adapted into a movie of the same name by Fernando Meirelles. Blindness tells the story of an unexplained mass epidemic of “white blindness” that affects nearly everyone in an unnamed city. The government, in an attempt to contain the contagion, places those affected by it in quarantine. What follows are the consequences to not only those affected by this new blindness, but to society as a whole. Like other books by Saramago, it contains many long, breathless sentences. The only punctuation marks used are commas and periods, and the lack of exclamation or interrogation marks can take some getting used to. It also lacks quotation marks for its dialogues. The dialogue is characterized by commas followed by capital letters. The characters are referred to by their position or some other characteristic (“the doctor’s wife,” “man with black eye patch”) rather than by their names. I’ve read the book twice already, first in Portuguese then in English, and I know I’ll read it again at some point in my life. I think the author does a wonderful job at writing the scenes in a way you can actually visualize what is happening. The scenes are not always pleasant, but are written in such an interesting way I couldn’t put the book down. It’s a book that makes you think about ethics, about human rights, about how we, as a society, behave in extreme situations, and about man’s will to survive against all odds. I definitely recommend this book. Another reason why I’m going to hell. But that’s okay, because that’s where most of my friends will be anyway. This whole post was written a while ago, but only now is coming to life. I was having an off day, which is fine, it tends to happen from time to time, and I usually just brush it off and keep going because I know it won’t last forever. I mean, it can’t last forever, and the next day has to be better, because an even always follows an odd. That’s math. You can’t argue with math. And what do I do when I’m feeling down? I go to my favorite store in town (totally didn’t mean for that to rhyme, by the way): Half Price Books. Apparently they are all over the place, so definitely check them out. Anyway, I walked around, got a few notebooks, the book On Writing by Stephen King, plus three books by José Saramago: one copy of The Double and two copies of Death with Interruptions. Both are great, I’ve read them already. In fact, I already own a copy of the second one, so the two copies I bought this time are going to two lucky friends of mine. But as I was not totally happy, I kept on walking around. Just being surrounded by books already helps improve an odd day for me. However, after you walk around the same aisles three times, people tend to look at you suspiciously. To avoid that, I decided to walk over to the game section. 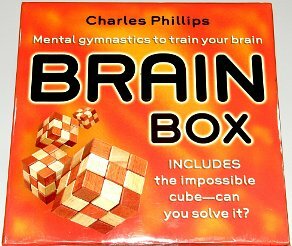 And that’s when I saw it, the reason why I’m going to hell: Brain Box Wood Cube. Tell me you see what I'm seeing. Right now you’re probably thinking I’m insane and that there’s nothing wrong with that game. And you’re probably right. But that’s only because you were not in my head at the time. Let me explain. When I looked at the wood cube, the first thing that crossed my mind was how much it resembled a Rubik’s Cube, but colorless, since it’s all in different shades of beige. So what did I think? Rubik’s Cube for color blind people! Think about it. It would be a perfect gift for that color blind friend who always felt left out because he could never play the game. I’ve know a lot of color blind people in my life (okay, only four, but still, four can be a lot) and I always thought about buying one of them a Rubik’s Cube, just to see their reaction, but never did. One of my color blind friends, by the way, loves pink and purple. Once she asked me to help her shop for a dress. I said they had that dress in black, blue, and purple, and my friend was like, “Purple? I love purple! Which one is it?” I’m so not kidding. Of course I made her tell me which one was it. After all, she’s the one who loves purple. Back to today’s story. So I’m at the store, I see the wood cube, and then I have to buy it for a color blind friend. Of course! I can imagine my friend opening the gift and me saying, “It’s a Rubik’s Cube for color blind kids!” all excited, because there’s no way you can’t be excited at something like that. I can even imagine my friend’s face, even with that pause that you do before doing your ‘present face’. It will be priceless!! Finally a Rubik's Cube that won't make that color blind friend feel left out. P.S. : I really like this site about color blindness, or, as some prefer, color deficiency, and how they explain life’s minor frustrations (and occasional dangers) for the color blind. Or you can try to see how color blind people would see your site to understand a bit more about how it works.